David Kohn Architects has refurbished a series of galleries in London's V&A to create a new photography centre that houses the museum's sensitive collection. The V&A Photography Centre spans three galleries and contains artworks and artefacts documenting photography from its invention to the present day. Glass cases either side of the doorway on the entrance landing hold 140 cameras, visually documenting this time frame. Inside the exhibition space photographs, negatives, archive materials and the personal belongings of notable photographers are on display in various settings. London-based practice David Kohn Architects gently intervened to update the way that the museum's collection was displayed and tease out the links between photography and architecture. "The most rewarding part has been spending time with a world class curatorial team, lead by senior curator, Martin Barnes, and learning about the history of photography," David Kohn told Dezeen. "A project like this is a wonderful education and in a subject I am passionate about." A wood-panelled "dark tent" area holds a multimedia projection screen under a tented grey roof, with concertina sides and a sliding door. Like the travelling dark rooms of the 19th century, the tented room can be screen off to create a cinema-style lecture area. Gabled glass display cases were conceived of as a "miniature houses", and can be reconfigured if the museum decides to change the layouts of the displays. Many of the objects are fragile and sensitive to light, and the architects had to design a space that would preserve them whilst still making them accessible to the public. David Kohn Architects worked with the curatorial team and engineers to install a climate control system complete with a bespoke ventilation above the gallery in the museum's roof. A layer of insulation was also added to reduce heat loss and keep the temperature constant. "A large part of the project was integrating modern services into a listed building," explained Kohn. "These are necessary to protect the fragile exhibits but should not compromise the historic fabric. In the end, the services are invisible, whilst being the life support system of the museum object." Teal and mustard-painted walls contrast with the dark photograph frames and pick out the rich colouring of the original semi-circular murals that sit above the gallery's picture rail. 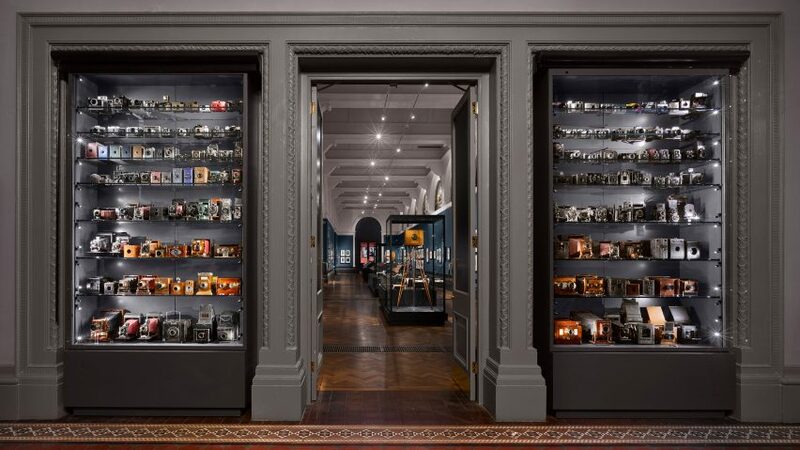 A handling table gives visitors to the V&A a chance to interact with the exhibits, including stereoscopic viewers, and a digital wall showcases the potential of the latest in photographic technology. The V&A is currently undertaking a development programme it calls the Future Plan, updating the museum's public spaces whilst restoring the historic building. Stirling Prize-winning architect Amanda Levete's firm AL_A undertook a £54.5 million project to create subterranean galleries with a roof that forms a porcelain tile-covered courtyard entrance for the museum, as part of the programme. London studio Carmody Groarke converted a gallery space on the fourth floor into a mirrored members room, and British fashion designer Christopher Raeburn created a new uniform for the museum's staff with prints featuring items from its collection.